As it continues to expand its health related programmes, the Church is seeking to work collaboratively with the government and other agencies by sharing experiences and resources, and looking at ways to enhance facilities and encourage good practice. Workshops bring together key players to examine issues such as reproductive health, the reduction of maternal and infant mortality, and the prevention of transmission of HIV from mother to child. Countrywide, the challenges in the health sector are immense in terms of destroyed or poor infrastructures, inadequate financial and material resources, and few well trained and experienced personnel. The drain of good doctors and other practitioners to other parts of the world leaves the country depleted in terms of adequate health provision. There is a need for the expertise and compassion of Christian doctors and nurses. A new administration block, laboratory, and kitchen at the hospital at Matana, and a new staff house and isolation ward at the health centre at Nyankanda - formerly a leprosy hospital - are signs of the Church’s growing involvement with and commitment to health care in Burundi. Through its integrated health programmes the Church has been seeking to assist those most at risk especially children, orphans, youth, and women, specifically in the areas of malaria and HIV/AIDS prevention. 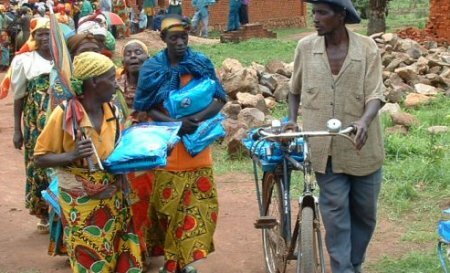 Malaria continues to be the leading cause of death in Burundi especially among women and children. The Church has been actively engaged in a comprehensive programme benefiting all dioceses involving education about malaria and the use of mosquito nets, the distribution of impregnated nets, and the monitoring of their proper use. The challenge of the HIV/AIDS (SIDA) pandemic is very real. The extent of the problem in Burundi is difficult to assess due to lack of testing and fear of stigma and discrimination. The Church is committed to engaging with some of the issues and an Inter-Confessional Network is trying to raise awareness and impact constructively the lives of those suffering from HIV and AIDS. Associations have had access to micro-credits in order to start small projects that empower people to enjoy some independence. Training events and workshops have facilitated discussion at community level and helped to increase awareness and knowledge regarding HIV and AIDS. In association with Mothers’ Union efforts have been made to address the problem of mother to child transmission. Special support has been provided for pupils who are HIV positive and orphans. Stop SIDA Clubs have been established in Church schools in order to educate pupil about sexual matters and HIV and AIDS. Such clubs provide safe forums for students to ask questions and encourage responsible behaviour. One diocese has been promoting the Universal Chastity Education programme. This targets older teenagers and young adults with a message of abstinence and faithfulness as the best methods of fighting against HIV/AIDS. Education on health issues is not restricted to the young. Students preparing for ordained ministry have had a short course looking at some of the relevant ethical issues in a theological framework. Men are being encouraged to be involved and act responsibly in their families and communities particularly in the care and respect of women. The Church is seeking to respond to the Biblical imperative to support widows and orphans, take care of the vulnerable and those at risk, show compassion for the sick, and support the dying.